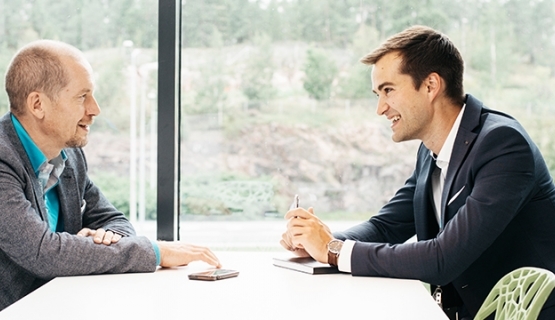 “I anticipate new winds, new thinking.” Kai Rönnberg’s supervisor Ari Numminen, Vice President Service Mineral Processing at Outotec summarizes his expectations for his employee’s MBA training, as Rönnberg nods on and adds his comments when needed. Kai Rönnberg joined the Aalto MBA program at the start of 2016, and has his sights on graduating at the end of 2017. The MBA Journal series follows his thoughts and experiences, as he advances in his studies. It all began with a development discussion many years ago. According to Numminen, the company does not have a certain program in place for steering employees to take part in external training. This requires employees to take initiative, and for the timing to be right. The next phase is to discuss a suitable model for further training and development. During our development discussion, we decided to look for a suitable study option. “Ari is a people manager, who focuses on individuals,” Rönnberg praises. A supervisor interested in his employee’s career path is definitely a motivating factor. Numminen, on the other hand, thinks that Rönnberg’s example may inspire others to think about training alternatives. Outotec has a process in place to recognize key experts within the company, and seeks to systematically develop employees. Study plans are never made on a moment’s whim. In Rönnberg’s case, the thought had been part of discussions already for four years. So far, the experience of combining studies and work has been positive. Rönnberg shares his study experiences with his colleagues via Yammer. During the spring, he has written three articles on the topic, receiving encouraging feedback from colleagues. “Sharing what you have learned with others also refines your own thoughts.” Rönnberg is in contact with Numminen on a daily basis at work, receiving his ongoing support. Expectations of the supervisor and company towards Rönnberg’s studies are hard to measure. Numminen emphasizes that it is not about developing technical expertise, which you pick up at work anyway, and Rönnberg’s previous degree already serves as a solid background. Instead, the purpose is to instill management expertise as well as additional business development skills and intellectual capital. Study modules that foster new thinking and broader perspectives gained from the MBA group are beneficial. “I think the impact of the studies will be demonstrated in concrete actions in business life,” comments Numminen.